One of the most fondly remembered addresses in all of the Pine Hills, this stately Victorian was home to a branch of the Albany Public Library for many years. Well-worn stairs and the smell of books -- for a few generations of Pine Hills children, this was a second home. The house was built in 1898-1899; its first occupants were Henry Dumary, president of the Helderberg Cement Company, and his wife, Carrie. After fifty-odd years as a residence, the building was purchased by Saint Vincent de Paul parish, which rented it to the city for use as a library. The Pine Hills branch opened in 1952. Knickerbocker News headline from January 18, 1951. 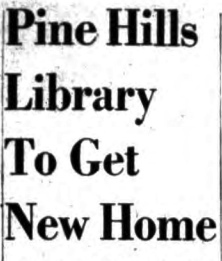 The Pine Hills library branch had previously been in School 4, corner of Madison and Ontario; climbing enrollment prompted the school to claim that space. Being adapted for use as a library meant the space had its limitations. Newspaper editorials were complaining by the mid-1960s that the building was "entirely inadequate" for a high-circulation library; later news stories would refer to the branch with words like "deteriorated" and "leaky." But for patrons, especially young ones, the grand old place had its charms. To pull open the heavy oak door of the library! — then to encounter, first, the silence; and slowly to note the creak of floorboards and the squeak of rubber soles on grey linoleum tacked down in heavily trafficked areas. Then to hear the clank of antique radiators and to smell the radiator heat. Then to notice the pleasant odor of old lady clothes, and of those replacement library bindings, which seemed to be made of plastic chitin and gave off a noxious smell that provided a good buzz. Then, at the same moment, both to smell and to see the wood varnish on the golden lintels and rood screens and turned bannisters of the magnificent staircase … It was a kind of heaven. 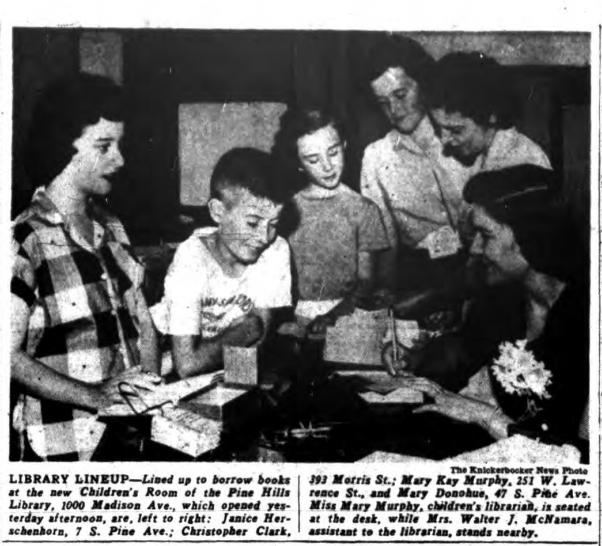 Knickerbocker News photo from Sept. 4, 1952, on the opening of the Children's Room. The children’s room was at the top of this great set of steps. One climbed with gusto much as a salmon returns, undaunted, to home. Nowadays no one would put a children’s room up so many steps, but back then it seemed a happy enough penance, like that felt upon mounting the steps of an altar. At the top of the flight, the young supplicant turned to the right and passed an angled library desk of unapologetically Danish-modern lines. This barrier reef protected worthy librarians from the hordes of young, literate, pillaging Visigoths. The desk featured a purpose-built well in the top, marked out into long slots by dividers. The slots were dedicated to the filing of the stamped cards pulled from the circulating treasures one could discover in the children’s room. (Babar and Madeline; Peter Rabbit and The Cat in the Hat; the Narnia books, Harriet the Spy, The Wizard of Oz.) The librarians, gentle if distracted, every last one of them, leaned on the heels of their chapped hands, rubber bands around one wrist or both, and showed great jaws full of huge teeth, more or less gripped into a smile, as the ladies accepted books for stamping. "It was my second home, intellectually," he wrote. "Therefore, that the collection was housed in a great and noble building originally designed as a home seemed fitting and even holy." In 1986, the College of Saint Rose purchased the building, and the library moved into the old telephone exchange building near the Madison-Western Point. Today, 1000 Madison Avenue is the college's administration center and houses the provost's office. Have memories of the library to share? Send them to history (at) uppermadison.org and we'll post them.